Myrtle Beach is located on the sunny coast of Southern California and is one of the best places in the world to play golf. In fact, this destination features a host of international standard golf courses and attracts golf fanatics from all over the world. People who are new to the game and want to unwind for a while by playing a round or two will also find an excellent range of greens to practice on here and get into the swing of things. Arcadian Shores was designed by the renowned Rees Jones and is set among some magnificent oak trees and lakes. The course offers golfers three sets of tees to choose from and contains up to 71 different bunkers. The course is quite challenging, as it features a 132 slope rating, which means that people who are looking to step up their game will be able to get the practice they need here. People who are in search of a few pointers will also be able to arrange lessons through the onsite Arcadian Classic Golf School. Heathland at Legends Golf Club is another public golf course that has a reputation for excellence. It can be found on the picturesque Legends Drive and offers enchanting beach views. The course was designed by Tom Doak following classic Scottish-style links and opened its doors to the golfers back in 1990. 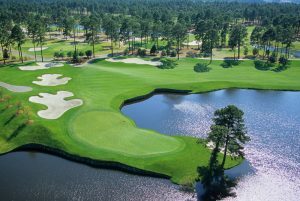 The design of the Grande Dunes Golf Course is famous for being one of the best in the whole Myrtle Beach area. This choice location overlooks Intracoastal Waterway and offers golfers panoramic views of the maritime forest and Waterway. The wide Bermuda grass fairways feature numerous elevation changes as well as 34 acres of lakes and this is ideal for players of all levels. The club house here is also excellent and is a great place to enjoy further relaxation at the end of the game.